The Major of Frameries took place this week-end with more than 220 players from 17 nations taking part in a wonderful event. 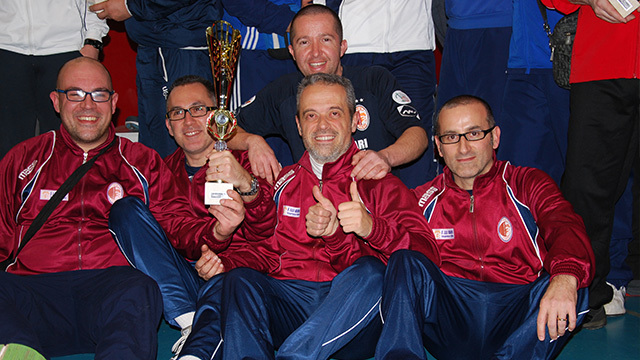 On saturday the team event had an amazing of more than 50 teams taking part but in the end, the reigning european champions of Reggio Emilia (Italy) took the honors after defeating Austria’s TFC Mattersburg in the final. It was not enough for the club of captaim Marco lamberti as Carlos Flores also won the Open category after a close final against Belgium’s Valéry Dejardin. It was another Reggio Emilia player, Malta’s Massimo Crmeona, who made a sensational debut in the veterans section. The former world number one had to play the qualification round but was in a hot day to beat Nuno Noronha in the final. The other winners of the week-end were Antonio Jesus Casin (U19), Marco Di Vito (U15), Noé Scheen (U12) and the Swiss princess Trisha Baumeler in the ladies section.